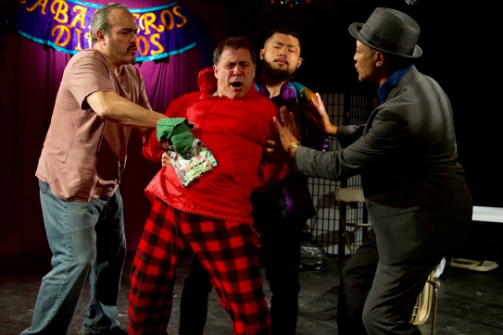 L-R: David Zayas, David Deblinger, Robert Lee Leng, and Paul Calderon in Divine Horsemen. BOTTOM LINE: A story about three comrades, first-edition comic books, and a scheme that goes dangerously wrong. As most people know, get-rich-quick schemes are generally a terrible idea. There’s no way to account for the infinite number of ways that other people’s foolishness, violence, ego, or greed can lay waste to even the best-laid plans. Yet, that doesn’t stop three neighborhood buddies from attempting a theft that turns out to be more than they can handle. Set in a social club in Spanish Harlem, Paul Calderon’s Divine Horsemen introduces three friends desperate for extra cash and always on the search for the next big scheme. The alpha of the pack is the slick and overly confident Willie, performed by the playwright. He doles out orders to both the social club’s gruff owner Iffy (David Zayas) and the naïve Benny (Robert Lee Leng) who aimlessly dreams of a bigger, richer life for himself. So when Benny storms in sputtering about a perfect plan and “huge bills,” it’s no surprise his comrades can’t take him seriously at first. Iffy doesn’t need any more trouble in his life, and Willie has his own machinations to orchestrate. But the more Benny explains about the acquaintance who just died, the piles of baseball cards and first-edition comic books he left behind, and the thousands of dollars they’re worth, the harder he becomes to ignore. Willie puts a plan together and, against his better judgement, Iffy goes along for the ride. The plan is far from fool-proof—Willie assumes his wiles will be enough to resolve too many variables, including the deceased’s cognitively challenged brother Raffi (David Deblinger) who refuses to leave the comics unattended. So when Willie and Iffy return to the club, salivating over the potential riches they’ve just stolen, they never expect Raffi to pay them a visit. His arrival challenges the three comrades to look deep within themselves and decide just how far they’ll go to succeed. This high-stakes drama is also jam-packed with fast-paced banter. The characters’ stereotypical mile-a-minute conversations immediately place the show in New York City, even without the Yankees posters that dot the walls. To be clear, zipping from wit to explosive violence is quite the feat, and the ensemble meets the challenge. And Deblinger’s entrance as Raffi elevates the cast’s performance to a new level of turbulence. But when you take away the punches, the New Yorkese, and the over-abundance of machismo, there isn't much else to Divine Horsemen. What starts as an exercise in tough-guy tropes seems to attempt a moral statement on cruelty, but the horrendous torment and abuse inflicted on Raffi is more offensive than profound. Frankly, the abuse is so extreme it’s difficult to say if Iffy and Benny suddenly come to his defense out of true empathy, or if it’s simply a matter of self-preservation. The principal issue, however, is that Divine Horsemen suffers from a case of poor timing. It was first presented in a workshop production at the LAByrinth Theater Company in 1995, featuring Calderon and Zayas in the original cast along with John Oritz, Johnny Sanchez, and Philip Seymour Hoffman. After more than twenty years, Calderon’s script is certainly overdue for a world premiere. Yet a production showcasing toxic masculinity and ableism without any self-reflection makes for an awkward participant in the conversation of current events.